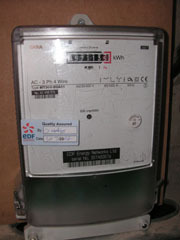 Your digital meter displays readings in one row of figures (single register) or two rows of figures (two registers). Your dial meter comprises of six dials. These read from left to right. You only need to read the first five dials - starting with the 10,000kWh dial on the left and stopping after the 1 kWh dial. Don’t read the last dial on the right – it is for testing purposes only. Remember that the dials move in opposite directions, as shown by the red arrows in the picture below. If the pointer falls between two numbers, always read the lower number – in Fig A you would write down the number 4. If the pointer is directly over a number always record it – in Fig B you would write down the number 5. 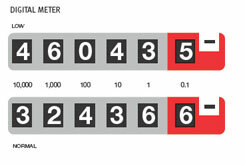 If the pointer on a dial falls between 9 and 0, reduce the reading already taken for the dial on the left by one – for example, if your original recorded 5, reduce this to 4. Following these instructions, the correct meter reading for the dial in the diagram will be 44928. 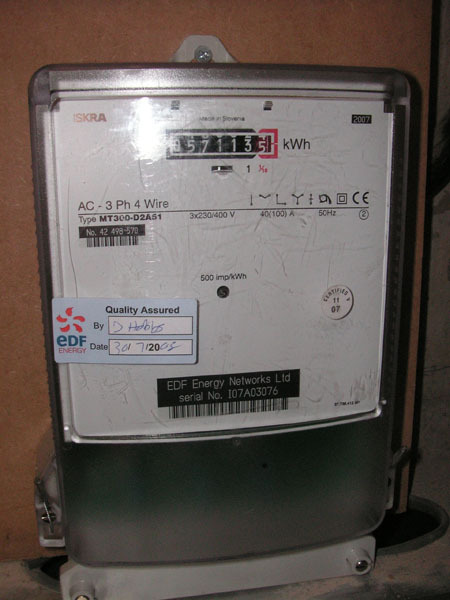 Your electronic meter always displays the charging rate currently in use – Rate 2 during the day and Rate 1 or Economy 7 at night. Please write down the rate showing and submit it with your reading.